The cheapest cap one can get is the Aam Aadmi political party cap popularized by the new political party at Delhi, India. The price is the lowest point and looks like the famous Gandhi cap. From this single digit to high 3 figure price in Indian Rupees is due to fabric and finishing to make it look even impressive on a millionaire at a golf course. Caps are used for different purpose at different times by different sets of people. For example by students while graduating, by workers for extra comfort during their regular work, by spectators for comfort at the stadium and by sportsmen while playing the game for bringing extra focus to their performance in the game. 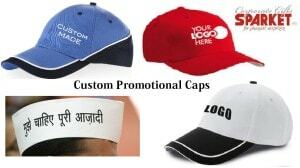 For mass distribution you can get a low priced non-woven fabric cap with multi-color logo printing at your budgeted price. The price increases for the 6 panel cap over 5 panel caps. Embroidery is expensive and price depends on both the time it takes and the thickness of the thread. Screen printing goes by the number of colors as so many impressions are required to place your logo and the message. If you need air outlets at the top then that cost extra due to increase in workmanship. How One Corporate Can Get Benefits from Caps Orders? The minimum quantity can be even 20 and normally due to lower price points order size is 300 to 500. Large quantities from 20,000 to 50,000 are ordered by cement, plumbing and companies where people are required to work outside in the open as it protects from the direct sunlight. Sports and stadium sees the bulk variety of caps as it becomes a must for the audience to protect themselves against strong sunlight. To cut cost you get paper caps which only protects the eyes of the wearer from the direct sunlight. Golf has its own cap named after the game to protect the players from the direct heat. Even Mercedes finds it worthwhile to distribute good quality caps to their customers as they cherish it and use it personally instead of giving it to their chauffer if the quality is impressive and presentable. The new technology has made it possible to have LED lights on the cap to use it at night as focus light. Similarly you get a cap fitted with a fan to help you overcome the heat by using solar powered fan. In extra hot places you get caps with the net too to allow movement of air. The caps can be personalised with the names to give it that much more appeal. Smart companies has made promotional caps with their logo and message a regular promotion items throughout the year as they get the maximum mileage at a low cost. In fact they silently measure their actual reach by the number of cap distributed by an area or region during a period to gauge the field activities by the local team. And when they measure the results achieved in that particular territory there are no real surprises as to why the sales are always going up in that particular area. Similarly the area consuming the lowest cap is also the lowest performing area. Are you surprised with the above facts, think and not only make caps but also ensure they are well distributed may be more than your products and you will soon see your product sales graph going up too!